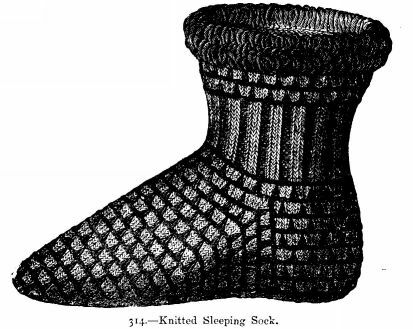 312.--Knitted Sock for a Child. Materials for 1 pair: 1 ounce of single Berlin wool; 1 yard of narrow pink or blue ribbon; 2 fine steel pins. This sock fits well, and is easy to make. It is knitted upon two pins, backwards and forwards. Cast on 22 stitches and knit 22 rows, but increase once at the end of every other row on the right side of the work, so that there are 33 stitches in the 22nd row. Now cast off 28 stitches and knit 12 rows, increasing 1 stitch at the end of every other row. Now 12 more rows, decreasing 1 stitch at the end of every other row; this forms the toe. Cast on 28 stitches on the same needle, and knit 22 rows, decreasing 1 stitch at the end of every other row, and cast off. Pick up the 68 stitches on the upper part of shoe, and knit 20 rows, alternately 2 plain and 2 purl rows, decreasing 1 stitch on each side of the 12 stitches in every other row, which forms the toe and front of sock. Knit 14 rows of 2 plain, 2 purl stitches alternately, then 3 open rows with 1 plain row between. The open rows are worked as follows:--* Purl 2 together, purl 1, make 1, repeat *, 3 plain rows, 1 open row, 1 plain row, and cast off. The sock is sewn together down the back of leg, centre of sole, and the point joined like a gusset to form the toe. 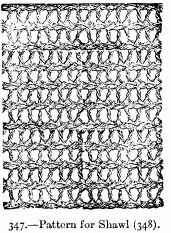 313.--Knitted Pattern for Counterpanes, Berceaunette Covers, Couvrettes, Antimacassars, &c.
Materials: Messrs. Walter Evans and Co.'s knitting cotton; 5 steel knitting-needles of a corresponding size. According to the size of the cotton employed, this beautiful square makes different articles, such as counterpanes, couvrettes, &c. &c. If  worked with Evans's cotton No. 10, it will be suitable for the first-mentioned purpose. Begin the square in the centre, cast on 8 stitches, 2 on each needle; join them into a circle, and knit plain the 1st round. 2nd round: * Knit 1, throw the cotton forward, knit 1; repeat 3 times more from *. 3rd round: Plain knitting. This knitted round is repeated after every pattern round. We shall not mention this again, nor the repetition from *. 4th round: * Knit 1, throw the cotton forward, knit 1, throw the cotton forward, knit 1. 6th round: * Knit 1, throw the cotton forward, knit 3, throw the cotton forward, knit 1. 8th round: * Knit 1, throw the cotton forward, knit 5, throw the cotton forward, knit 1. The 9th to 18th rounds are knitted in the same manner, only in every other round the number of stitches between the 2 stitches formed by throwing the cotton forward increases by 2, so that in the 18th round 15 stitches are knitted between. 20th round: * Knit 1, throw the cotton forward, knit 1, throw the cotton forward, knit 5, slip 1, knit 1, draw the slipped over the knitted stitch, knit 1, knit 2 together, knit 5, throw the cotton forward, knit 1, throw the cotton forward, knit 1. 22nd round: * Knit 1, throw the cotton forward, knit 1, throw the cotton forward, slip 1, knit 1, draw the slipped over the knitted stitch, throw the cotton forward, knit 4, slip 1, knit 1, draw the slipped over the knitted stitch, knit 1, knit 2 together, knit 4, throw the cotton forward, knit 2 together, throw the cotton forward, knit 1, throw the cotton forward, knit 1. 24th round: * Knit 1, throw the cotton forward, knit 1, throw the cotton forward, slip 1, knit 1, draw the slipped over the knitted stitch; throw the cotton forward, slip 1, knit 1, draw the slipped over the knitted stitch, throw the cotton forward, knit 3, slip 1, knit 1, draw the slipped over the knitted stitch, knit 1, knit 2 together, knit 3, throw the cotton forward, knit 2 together, throw the cotton forward, knit 2 together, throw the cotton forward, knit 1, throw the cotton forward, knit 1. 26th round: * Knit 1, throw the cotton forward, knit 1, throw the cotton forward 3 times alternately, slip 1, knit 1, draw the first over the last, throw the cotton forward; knit 2, slip 1, knit 1, draw the first over the last, knit 1, knit 2 together, knit 2, three times alternately, throw the cotton forward, knit 2 together, throw the cotton forward, knit 1, throw the cotton forward, knit 1. 28th round: * Knit 1, throw the cotton forward, knit 1, four times alternately, throw the cotton forward, slip 1, knit 1, draw the slipped over the knitted stitch; throw the cotton forward, knit 1, slip 1, knit 1, draw the slipped over the knitted stitch; knit 1, knit 2 together, knit 1, four times alternately throw the cotton forward, knit 2 together, throw the cotton forward, knit 1, throw the cotton forward, knit 1. 30th round: * Knit 1, throw the cotton forward, knit 1, six times alternately throw the cotton forward, slip 1, knit 1, draw the slipped over the knitted stitch, knit 1 six times alternately, knit 2 together, throw the cotton forward, knit 1, throw the cotton forward, knit 1. 34th round: * Knit 1, throw the cotton forward, knit 1, 7 times alternately throw the cotton forward, slip 1, knit 1, draw the slipped over the knitted stitch, knit 1, 7 times alternately knit 2 together, throw the cotton forward, knit 1, throw the cotton forward, knit 1. 36th round: * Knit 1, throw the cotton forward, knit 1, 7 times alternately throw the cotton forward, slip 1, knit 1, draw the slipped over the knitted stitch, throw the cotton forward, knit 4 stitches together, 7 times alternately throw the cotton forward, knit 2 together, throw the cotton forward, knit 1, throw the cotton forward, knit 1. 38th round: * Knit 1, throw the cotton forward, knit 1, 8 times alternately throw the cotton forward, slip 1, knit 1, draw the, slipped over the knitted stitch, 8 times alternately knit 2 together, throw the cotton forward, knit 1, throw the cotton forward, knit 1. 40th round: * Knit 1, throw the cotton forward, knit 1, 8 times alternately throw the cotton forward, slip 1, knit 1, draw the slipped over the knitted stitch, throw the cotton forward, knit 3 stitches together as 1 stitch, 8 times alternately throw the cotton forward, knit 2 together, throw the cotton torward, knit 1, throw the cotton forward, knit 1. You now have 41 stitches on each needle; knit 1 round, and cast off. When completed, the squares are joined together on the wrong side. Materials for one pair: 4 ounces white fleecy, 3 ply; 1 ounces light blue fleecy. 2nd round: Purled; both these rounds are worked with blue wool. 3rd to 6th rounds: Knitted plain with white wool. 7th round:With blue wool; knit 3, draw the wool through the next stitch of the 2nd round worked with blue wool, draw it out as a loop, keep it on the needle, knit again 3 stitches, and so on. 8th round: With blue wool; the loop which has been taken up on the preceding round is purled off together with the preceding stitch. Repeat the 3rd and 8th rounds  twice more; the loop of one round must be placed between those of the preceding one. Then knit with white wool 31 rounds, alternately 2 stitches knitted, 2 stitches purled, then work the foot in the diamond pattern in the same way as usual for a stocking. The heel is formed by leaving 23 stitches on each side the seam stitch, and knitted backwards and forwards in the diamond pattern. At the toe decrease so that the decreasings form a seam on both sides of the toe. This is obtained by knitting the 3rd and 4th stitches of the 1st needle together; on the 2nd needle slip the 4th stitch before the last, knit the next stitch and draw the slipped stitch over the knitted one; decrease in the same manner on the other 2 needles of this round. Repeat these decreasings  exactly in the same direction and at the same places, so that there are always 4 stitches between the 2 decreasings at the end and at the beginning of 2 needles; they always take place after 3 or 2 plain rounds, and at last after 1 plain round. The remaining stitches are knitted off 2 and 2 together. To complete the sock, the outline of the sole is marked by working slip stitches with blue wool in crochet all round it; work also slip stitches on the selvedge stitch of the heel. The stocking is finished off at the top with a double round of loops in blue wool, worked over a mesh four-fifths of an inch wide. 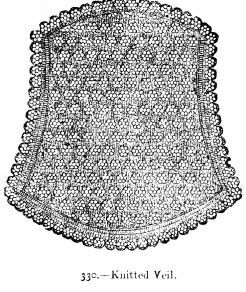 315 and 316.--Netted Fichu or Cape. Material: Fine wool, or white and blue silk; netting needle and meshes. This fichu or cape is made either with fine wool or with silk used three or four times double. It may be worn as an evening wrap, either over a cap or on the hair, or as a necktie. The ground in our pattern is white, the border blue. The illustration of the ground and of the border, in full size, will serve as a guide for the size of the meshes to be used. For the ground cast on the first mesh, with white silk, 56 stitches; work 2 rows on the 56 stitches. From the 3rd row, always miss the last stitch, so that each row is decreased 1 stitch. Continue in this manner till the 39th row, when there will be but 19 stitches left. From the 40th row, miss 2 stitches at the end of each row. The ground is completed with the 46th row. The 1st row of the work is the cross-way side; the last, the point at the bottom; fasten on the blue silk to the 1st stitch of the 1st row, and on a larger mesh work 1 row round the ground of the fichu, not forgetting that the stitch on the outer edge at the sides must always be taken, and 2 stitches made in the 5th, 10th, 14th, 18th, 21st, 23rd, and 25th stitches at the sides, as well as in each of the 2 middle stitches of the last row; in each of the other stitches 1 stitch should be made. On the corners of the sides increase once, on the cross-way side, seven times in all. This forms the 1st round of the edging or lace. 2nd round of the lace: In each stitch make 2 stitches--still on the larger mesh. 3rd round: Always miss the small flat scallop formed in last row, and work 2 stitches in the stitch which forms a tight loop. Keep thus the same number of stitches, with which work 6 more rounds. For the last round, work 1 stitch in each tight loop. Materials: 2 skeins of black purse silk; 2 skeins of scarlet ditto; black jet beads; a steel clasp with chain; a tassel of black beads; 5 steel knitting-needles. 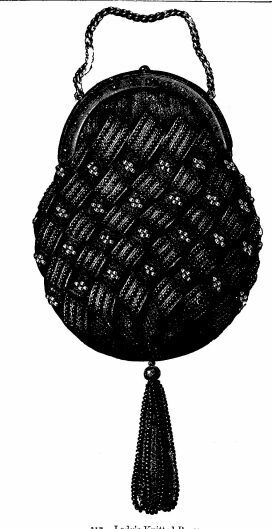 This purse is knitted with black and scarlet purse silk, and ornamented with black beads and a black bead tassel. Begin the purse with the black silk in the centre of the bottom part, and cast on for one part of it 7 stitches. Knit 14 rows on these backwards and forwards, in such a manner that the work is knitted on one side and purled on the other. The 1st stitch of every row is slipped, the 1st row of this part is purled. * On that side where hangs the thread with which you work take the back chain of the 7 selvedge stitches of the part you have just knitted on a separate needle, and knit another part, which must have 15 rows, and the 1st row of which is knitted. Repeat 10 times more from *. The stitches of several parts can be taken on the same needle, so as not to be hindered in working by too many needles. When the 12th part is completed, take the selvedge stitches on the left hand on another needle, cast them off together with the cast on stitches of the 1st part, and fasten the silk thread. Then take the 7 right-hand selvedge stitches of one black part on a needle, take the red silk on which the beads have been strung and work 15 rows on these stitches, the 1st row from the wrong side, and therefore purled; in the 1st, as well as in all the other purled rows, the last stitch must be purled together with the next stitch of the next black part. In the purled rows, moreover,  excepting in the first and last one, a bead must be worked in after casting off the 2nd, 4th, and 6th stitches. The stitch must be worked by inserting the needle into the back part, and in drawing through the silk which has been thrown forward, let the bead slide through the stitch so that it is on the right side of the work. In the following knitted row, the needle must also be inserted into the back part of the bead stitch. When 12 such red parts have been completed, work again 12 black parts on the selvedge stitch of the same, in which the beads are not knitted in, but sewn on afterwards, when the purse is completed. Then work 3 times more alternately 12 red and 12 black parts; when the last 12 black parts have been completed cast off the stitches of the last black part together with the selvedge stitches, the 1st on the wrong side; the stitches of the 6th part are cast off in the same manner together with the selvedge stitches of the 7th. The red parts which remain to be worked on the black part are thus lessened by 2; the 2nd, 3rd, and 4th, and the 7th, 8th, and 9th of these parts must be by 6 rows longer. Then gather all the stitches and selvedge stitches of the 10 parts on 2 needles, in such a manner that the 2 black parts, the stitches and selvedge stitches of which have been cast off together, are placed on the sides of the purse, and knit as follows with black silk, first on the stitches of the one needle, and then on those of the other:--1 row knitted, knitting together every 3rd and 4th stitch; then work 3 rows backwards and forwards on the same number of stitches, which must be knitted on the right side; then work 8 rows more in the same manner, casting off the 2 first stitches of the 8 rows. Then cast off all the remaining stitches, sew the beads on the black parts from illustration; also the clasp and bead tassel. 318 to 320.--Knitted Antimacassar or Berceaunelle Cover. Materials: Grey and violot fleecy wool. 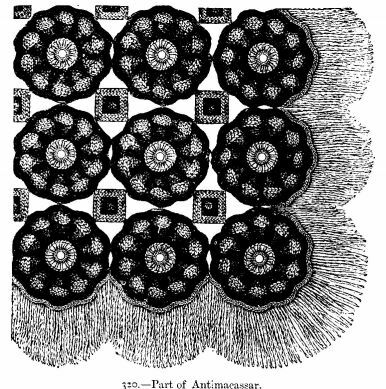 This antimacassar, part of which is seen on No. 320, smaller than full size, is made of rosettes and small squares, which are knitted separately with violet and grey fleecy wool with fine knitting-needles. In the middle of each rosette sew on a tatted circle of grey wool. 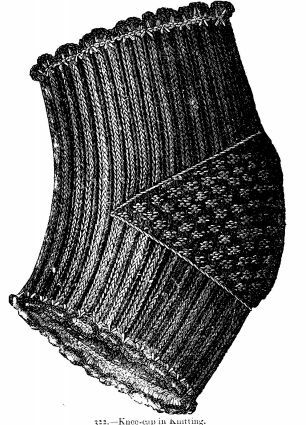 The edge of the antimacassar is ornamented with a grey woollen fringe. For each rosette cast on 6 stitches with violet wool, and knit 12 rows backwards and forwards in such a manner that the work is knitted on one side and purled on the other: the first of these 12 rows is purled, the first stitch of every row is slipped; * then take the first five selvedge stitches of the knitted part on a separate needle (on the side where the end of wool hangs down, leaving it unnoticed for the present), inserting the needle into the back chain of the stitch (the selvedge stitch which is next to the cast-on stitch remains, therefore, unworked upon), and knit on these a new part, which must have 13 rows; the first row is knitted, and in this row work 2 stitches in the first stitch, one purled and one knitted, so that this new part is equally six stitches wide. Repeat 8 times more from *. After having worked several parts, the stitches can, of course, be taken on the same needle, so as not to increase the number of needles. When the 10th part is completed,  take the selvedge stitches of the left-hand side of the same on a separate needle, cast them off with the cast-on stitches of the first part, and fasten the wool. Then take the 6 selvedge stitches on the right hand of one part on a separate needle; take the grey wool, and work on these stitches 13 rows backwards and forwards; the first row is knitted; it is worked on the right side of the work; in this, and in every following knitted row, knit the last stitch together with the next stitch of the next violet part. When 10 such grey parts are completed (each of the remaining 9 parts consists of 13 rows, and begins with one knitted row), take all the stitches and the selvedge stitches of these parts on four needles and knit with these stitches, also with  grey wool 1 row knitted, in which the 6 selvedge stitches must be decreased to 3 by knitting always 2 stitches together as 1 stitch; each of the other stitches is knitted as usual. Then purl 2 rows with violet wool, and cast off. For the tatted circle in the centre of the rosette, work with grey wool a circle consisting of 1 double, and 11 times alternately 1 purl 3-10ths of an inch long, 2 double, then 1 purl and 1 double. 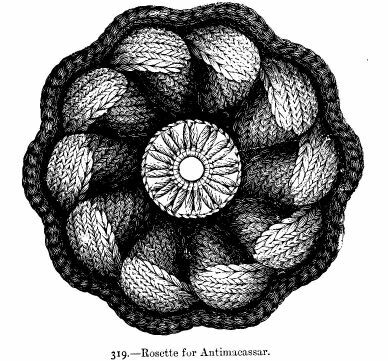 The circle is sewn on the rosette, from illustration, with grey wool. No. 319 shows such a rosette full size. The small squares (see No. 318) are worked with  grey wool; cast on 36 stitches, join the stitches into a circle, and purl 2 rows. To form the corners, knit together 4 times 2 stitches after every 7 stitches in the first of these two rounds, in the second round knit together 2 stitches after every 6 stitches; these decreasings and those of the other rounds must always take place, at the same places as in the preceding round. Then take the violet wool, and knit 7 rows; in the first of these knit 4 times 2 stitches together after intervals of 5 stitches; no decreasings take place in the 2nd, 4th, and 6th rows; in the 3rd row knit together 4 times 3 stitches as 1 stitch, and in the 5th and 7th rows 4 times 2 stitches as 1 stitch. After the 7th round, the remaining stitches are cast off together as 1 stitch. Then fasten the wool and cut it off. Lastly, sew the rosettes and squares together from No. 320 for a cover, and edge it round the border with a fringe of grey wool. Material: Messrs. Walter Evans and Co.'s No. 10 or No. 50 knitting cotton. If knitted with thick cotton, this border will be suitable for trimming a quilt or berceaunette cover; if, on the contrary, fine cotton is used, the pattern will form a very pretty collar for a little boy or girl. To make a collar, begin by a chain of 220 stitches, and work 6 rows backwards and forwards alternately, knitting 4 stitches and purling 2. In the 2nd, 4th, and 6th rows the 4 stitches are purled, and the 2 are knitted. 7th row: * Purl 2, make 1, knit 2, purl 2. Repeat from *. 8th row: Alternately purl 5, knit 2. All the rows with even numbers are knitted like this, except that the number of the knitted stitches are increased by 2 in each of them. We will not, therefore, henceforth mention these rows. 9th row: * Knit 2, make 1, knit 1, make 1, knit 2, purl 2. Repeat from *. 11th row: * Knit 2, make 1, knit 3, make 1, knit 2, purl 2. Repeat from *. 13th row: * Knit 2, make 1, knit 5, make 1, knit 2, purl 2. Repeat from *. The pattern is continued in the same manner. The small gores formed between the ribs are increased by 2 stitches in every second row. Each of these gores has 13 stitches in the 21st row, which is the last. Cast off all the stitches after this row. Take a crochet needle, and with the same cotton as that used for the knitting work 1 stitch of double crochet in every stitch of the selvedge, then the 2 following rows for the edging. 1st row: Alternately 1 treble, 1 chain, under which miss 1. 2nd row: Alternately 1 double over 1 treble of preceding row, 1 purl (that is, 5 chain and 1 slip stitch in the first), under which miss 1. Over the first row of the knitting work 1 row of close double crochet. The border is now completed. Materials: For 1 pair, 4 oz. pink 4-thread fleecy wool, and a small quantity of white ditto. Begin each knee-cap by casting on with pink wool 114 stitches, equally divided upon 4 needles, and joining them into a circle. Upon this number of stitches work 47 rounds, alternately knitting and purling 2 stitches. In the 48th round begin the gore which covers the knee; it is worked separately backward and forwards, always alternately knitting and purling 2 stitches. After 2 rows change the pattern, so as to form small squares Knit the first row of this gore upon 26 stitches slipped off from the last row on  to a separate needle. At the end of each following row knit the nearest stitch of the nearest needle, so as to increase 1 stitch in each row of the gore. Continue in this way until only 42 stitches remain of the ribbed part. After this work the remainder of the gore separately, decreasing once at the beginning and end of each row till only 26 stitches remain; then take up 23 stitches of the selvedge on each side of these 26 stitches, and work 47 rounds, alternately knitting and purling 2 stitches. The edging at the top and bottom of the knee-cap is worked in crochet. With white wool make a chain of 50 stitches; turn and work 1 row of crochet à tricoter; then work a second row thus: the first part, as usual, with white, but coming back, with pink make 4 chain between each stitch, work in the same way on the other side of the foundation chain, thus forming a small ruche, and sew it on to the edge of the knitting. 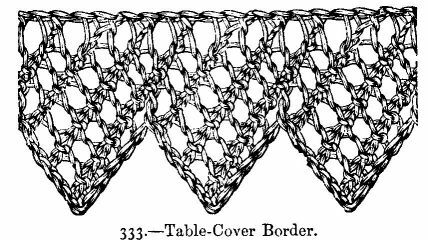 This three-cornered neckerchief is knitted in the following pattern (commencing at the corner). 1st row: slip 1, make 1, knit 2 together, inserting the needle into the back part of the stitch, slip 1, make 1, knit 2 together. 2nd row: Knit 1, purl 1 in the stitch formed by throwing the wool forward in the preceding row; the other stitches are purled. In the next row the holes are alternated; the neckerchief must of course be increased at the beginning and end of every other row. It measures at the upper edge 1 yard 16 inches across from one corner to the other; the lower corner is rounded off. 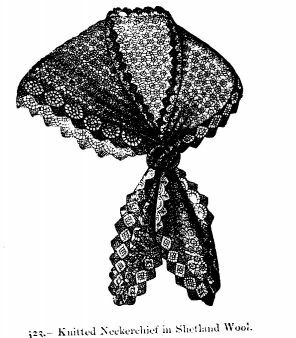 The neckerchief is edged with a knitted lace. The lace is worked in rows backwards and forwards, the cross way. Cast on 22 stitches and work the 1st row as follows:--Slip 1, knit 11, knit 2 together, throw the wool forward, knit 2 together, knit 6. 2nd row: Slip 1, purl 18, knit 1 and purl 1 with the stitch formed in the preceding row by throwing the wool forward. 3rd row: Slip 1, knit 2 together, knit 9, knit 2 together, throw the wool forward, knit 2 together, throw the wool forward, knit 2 together, knit 5. 4th row: Slip 1, purl 5, knit 1, purl 1, knit 1 in the stitch formed in the preceding row by throwing the wool forward, purl 13. 5th row: Slip 1, knit 2 together, knit 6, knit 2 together, throw the wool forward, knit 2 together, throw the wool forward, knit 2 together, throw the wool forward, knit 2 together, knit 4. 6th row: Slip 1, purl 8, knit 1, purl 1 in the stitch formed by throwing the wool forward in preceding row, purl 9. 7th row: Slip 1, knit 2 together, knit 4, knit 2 together, throw the wool forward 4 times alternately, knit 2 together, knit 4. 8th row: Slip 1, purl 3, knit 1, purl 1 in the stitch formed by throwing the wool forward in the preceding row, purl 13. 9th row: Slip 1, knit 2 together, knit 2, 5 times alternately; knit 2 together, throw the wool forward, knit 2 together, knit 2. 10th row: Slip 1, knit 1, purl 1 in the stitch formed by throwing the wool forward in preceding row, purl 5. 11th row: Slip 1, knit 2 together, 6 times alternately knit 2 together, throw the wool forward, knit 2 together, knit 1. 12th row: Slip 1, knit 1 in the stitch formed by throwing the wool forward in preceding row, purl 13. 13th row: Slip 1, throw the wool forward, knit 2, knit 2 together, 5 times alternately throw the wool forward, knit 2 together, knit 2. 14th row: Slip 1, purl 10, knit 1, purl 1 in the stitch formed by throwing the wool forward in preceding row, purl 5. 15th row: Slip 1, throw the wool forward, knit 4, knit 2 together, 4 times alternately throw the wool forward, knit 2 together, knit 3. 16th row: Slip 1, purl 3, knit 1, purl 1 in the stitch formed by throwing the wool forward in preceding row, purl 13. 17th row: Slip 1, throw the wool forward, knit 6, knit 2 together, 3 times alternately throw the wool forward, knit 2 together, knit 4. 18th row: Slip 1, purl 8, knit 1, purl 1 in the stitch formed by throwing the wool forward in preceding row, purl 9. 19th row: Slip 1, throw the wool forward, knit 8, knit 2 together, twice alternately throw the wool forward, knit 2 together, knit 5. 20th row: Slip 1, purl 5, knit 1, purl 1 in the stitch formed by throwing the wool forward in preceding row, purl 13. 21st row: Slip 1, throw the wool forward, knit 10, knit 2 together, throw the wool forward, knit 2 together, knit 6. 22nd row: Slip 1, purl 6, knit 1, purl 1 in the stitch formed by throwing the wool forward in preceding row. 23rd row: Slip 1, throw the wool forward, knit 12, knit 2 together, knit 7. 24th row: Purled. Repeat from the 1st row till the lace is sufficiently long. Then sew on the lace round the edge; the lace can be knitted somewhat narrower for the upper edge. 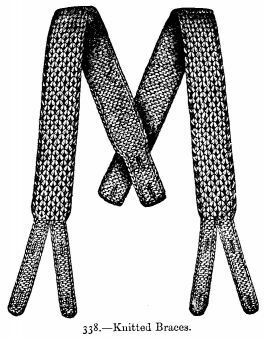 One of the ends of the neckerchief is knotted, As seen in the illustration, and the other end is drawn through the knot. Knitted Neckerchief in Black Shetland Wool. CO a multiple of 6 minus 1 (23, 29, 35…) that will give you 10 or 15 inches. Row 3: is exactly like row 1 until the last 5 stitches where you do half a repeat and then end like row 1. Like this: sl 1, yo, k2tog tbl, sl 1, yo, k1. Row 4 (and all even rows) same as row 2. Thanks!! to Lillian Bommarito ( lillybomm on Ravelry) for taking the time to chart this for us!! 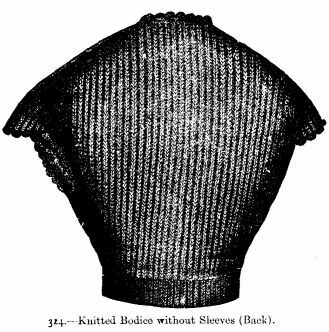 324 and 325.--Knitted Bodice without Sleeves. Materials: 4 ounces black, 3-1/2 ounces purple fleecy; black silk elastic; a steel buckle; 9 black bone buttons. 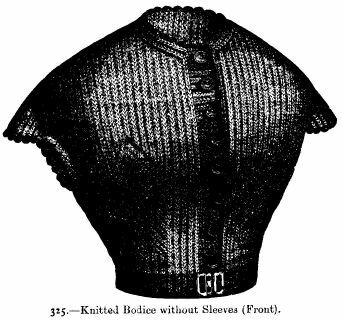 This bodice is knitted in brioche stitch with black and purple wool, so  that the raised ribs appear black on one side and purple on the other. The bodice fits quite close. It is fastened in front with black bone buttons and a steel buckle. Two strips of silk elastic are knitted in at the bottom. Begin at the bottom of the bodice with black wool, and cast on 170 stitches. The needles must be rather fine, and the knitting not too loose. Work backwards and forwards 24 rows as follows:--Slip the 1st stitch, alternately throw the wool forward, slip 1 as if you were going to purl it, and knit 1. In the next row knit together the stitch which has been slipped and the stitch formed by throwing the wool forward, slip the knitted stitch, after having thrown the wool forward. In the 25th row take the purple wool and work 1 row as before. Now work alternately 1 row with black wool and 1 row with purple, but as the wool is not cut off, the brioche stitch must be alternately knitted and purled. Work always 2 rows on the same side from right to left. The following 26th row is worked with black wool in common brioche stitch, only the slipped stitch of the preceding row is purled together with the stitch formed by throwing the wool forward. 27th row: Turn the work, with purple wool purled brioche stitch. 28th row: On the same side with black wool knitted brioche stitch. After having worked 40 rows all in the same manner, begin the front gore. Divide the stitches upon three needles, 82 stitches on one needle for the back, and 44 stitches for  each front part on the two other needles. Then work the first 11 stitches of the left front part (this row must be worked on that side of the work upon which the ribs appear purple) in knitted brioche stitch; the 11th stitch must have a slipped stitch, with the wool thrown forward, therefore it is a purple rib. After this stitch begin the gore with the following 13 stitches. The ribs are then worked so that a purple one comes over a black one, and a black one over a purple one. Do not work upon the following black stitch; knit the following stitch with the one formed by throwing the wool forward. Throw the wool forward, and then only slip the black stitch which had been left, so that it comes behind the stitch which has just been knitted. This crossing of the stitch is repeated once more, then knit the following stitch together with the one formed by throwing the wool forward, throw the wool forward, slip the crossed black stitch and the two following single black stitches. The slipped stitch and the stitch formed by throwing the wool forward before the 3rd single black stitch are then knitted together, so that the crossed stitches are placed in opposite directions. The three black stitches which are knitted off together as 1 stitch in the next row form the middle line of the front gore, and are continued in a straight line to the point of the gore. The crossing takes place twice in this row, but now the black stitch is slipped first. After the 24th stitch knit together the following stitch with the stitch formed by throwing the wool forward. Then continue to work in common brioche stitch to the other front part, where the gore begins before the 24th stitch from the end. In the next row, which is worked in purled brioche stitch with black wool, take up the black loop between two purple ribs after the 11th stitch; purl it so as to form the stitch  which is missing at that place. The 3 slipped stitches in the preceding row are purled together as one stitch with the stitch formed by throwing the wool forward between the ribs. The loop is also taken up on the other side of the front gore in the same manner, as well as on the other front part. Then work 6 rows without increasing or decreasing. The crossing of the stitch is repeated after every 7 rows, always on the knitted brioche stitch side, with purple wool. In the 18th row of the gore the 3 middle stitches are not knitted together, but separately, so that the pattern must be decreased in 26 rows. In the back 30 stitches only must be decreased, two in every 6th row. After the 60th row another decreasing takes place on the outer edges of the front parts for the neck; they decrease 2 stitches (1st rib) after the 5th stitch from the front edge in every 3rd row. The 5 stitches which close to the neck are cast off together with the 5 stitches on the shoulders. Then cast off loosely the stitches of the back; take all the selvedge stitches of the front on the needles, and knit 24 rows of brioche stitch with black wool, making 9 button-holes on the right front part. On the wrong side of this part sew on a strip of black silk, with slits worked round in button-hole stitch, stitching at the same time into the knitting. 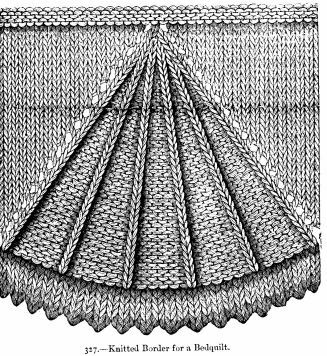 The following scallops are knitted round the top of the jacket and round the armholes with black wool:--Take the selvedge stitches on the needles, work 4 rows alternately, 1 stitch knitted, 1 stitch purled, thread the wool into a Berlin wool-work needle, * cast off 3 stitches together, draw the wool through the needle, and take the 2 following stitches on the wool in the worsted-needle; repeat from *. Sew on the buttons the strips of silk elastic on either side of the black stripe at the bottom, and fasten the ends of the latter with the steel buckle. Materials for one pair: 1/2 ounce red, 1/2 ounce white, Berlin wool; steel knitting-needles. 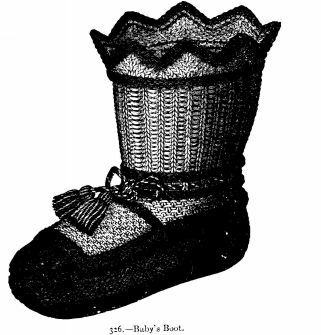 This pretty boot consists of a shoe knitted in red wool, and a sock in white wool ornamented with red. Begin the knitting with the upper scalloped edge of the latter. Cast on 96 stitches with red wool, divide them on four needles, and knit in rounds as follows:--1st and 2nd rounds: With red wool, purled. 3rd to 8th round: With white wool. 4th round: * Knit 4, throw the wool forward, knit 1, throw the wool forward, knit 4, knit 3 together. Repeat 7 times more from *. 5th round: Knitted; the stitches formed by throwing the wool forward are knitted as one stitch. Knit 3 stitches together at the place where 3 stitches were knitted together in the 4th round, so that the decreasing of the preceding round forms the middle stitch of the 3 stitches to be decreased in this round. 6th and 7th rounds: Like the 5th. 8th round: Knitted; you must have 48 stitches left. 9th to 11th round:With red wool. 10th and 11th rounds: Purled. 12th to 30th round: With white wool. 13th round to 30th round: Alternately purl 1, knit 1, inserting the needle in the back part of the stitch. 31st to 33rd round: With red wool. 32nd round and 33rd round: Purled. 34th and 35th rounds: With white wool. 35th round: Alternately throw the wool forward, knit 2 together. Each stitch formed by throwing the wool forward is knitted as one stitch in the next round. 36th to 38th round: With red wool. 37th and 38th rounds: Purled. 39th to 47th round: With white wool. Alternately purl 1, slip 1, as if you were going to purl it; the wool must lie in front of the slipped  stitch; in the following rounds take care to purl the slipped stitches. Take now 18 stitches for the front gored sock part (leave 30 stitches untouched), and work backwards and forwards with red wool. 48th to 50th row: With red wool. 51st to 85th row: With white wool in the pattern described in the 39th round. But as you work backwards and forwards you must alternately knit  and purl the stitches. Decrease 1 stitch at the beginning and at the end of the 84th and 85th rows; decrease 1 stitch in the middle of the 85th row, so that the 85th row has 13 stitches left. After this work with red wool. 87th row: Knit 1, purl 2, knit 1, purl 2, knit 1, purl 2, knit 1, purl 2, knit 1. Repeat these last 2 rows 3 times more and knit plain to the 94th, decreasing one, however, on each side. Now work with the whole number of stitches, taking up the selvedge stitches of the gored part and dividing them with the 30 other stitches on four needles. Knit once more in rounds; the next 20 rounds are alternately 1 round knitted, 1 round purled. In the 2 last knitted rounds decrease twice close together in the middle of the back part of the shoe. Knit 8 rounds; in every other round decrease twice in the middle of the front of the shoe, leaving 9 stitches between the two decreasings. The number of stitches between the decreasings decreases with every round, so that the decreasings form slanting lines meeting in a point. Cast off after these 8 rounds, by knitting together 2 opposite stitches on the wrong side. The sock part is edged with a raised red border, which is worked by taking all the red stitches of the 1st round of the shoe on the needle and knitting 4 rounds, so as to leave the purled side of the stitch always outside; then cast off very tight. Draw a piece of braid through the open-work row in the sock part, and finish it off at either end with tassels to match. 327.--Knitted Border for a Bedquilt. Materials: Messrs. Walter Evans and Co.'s No. 8 white knitting cotton; thick steel pins. 5th row: Alternately make 1, knit 2 together. Then 5 more plain rows. 3rd row:Knit 2, * make 1; knit 1 slantways; # purl 5; knit 1 slantways. Repeat from # four times more. Repeat from * to the end of the row. 4th row: The same as the second. The continuation of the work is clearly shown in our illustration. 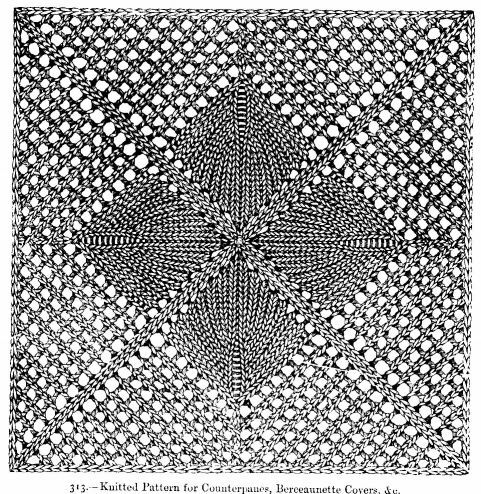 The increasing caused by knitting the made stitches is regularly repeated in each second row, so that the stitches between the striped divisions increase, and form large triangles; the striped divisions, on the other hand, are narrowed so as to form the point of the triangles. To obtain this result, decrease five times in the 6th, 12th, 18th, and 24th rows, by purling together the two last stitches of one purled division, so that each division has but eleven stitches left in the 25th row. In the 28th row knit together one purled stitch with one knitted slantways, so that there will be only 6 stitches left for each division; these stitches are knitted slantways in the 29th and 30th rows. In the 31st row they are knitted together, two and two. There remain in each division three more stitches, which are knitted together in the 34th row. Two rows entirely purled complete the upper edge of the border. Materials: 8-thread fleecy wool; wooden needles. This pattern may be worked in narrow strips of different colours, and in that case each strip should contain 1 row of patterns; or the quilt may  be composed of wide strips with several rows of patterns, those of one row being placed between those of the preceding. In the first case, that is if you work narrow strips, you may use several colours; but if wide strips are preferred, they should be of two colours only. Our pattern was worked in wide strips, alternately grey and red. Each strip is knitted the short way. 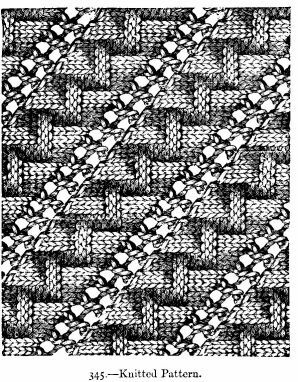 For a strip with five raised patterns in the width cast on 20 stitches. 2nd row: Right side of the work. Slip 1, purl 1, * make 1, purl 4. Repeat from * 3 times more; make 1, purl 2. 3rd row: Slip 1, knit all the stitches that were purled in the preceding row, and purl all those that were made. 4th row: Slip 1, purl 1, * knit 1, make 1, purl 4. Repeat from * 3 times more; knit 1, make 1, purl 2. 5th row: Slip 1, knit all the purled stitches, purl all the rest. 6th row: Slip 1, purl 1, * knit 2, make 1, purl 4. Repeat from * 3 times more; knit 2, make 1, purl 2. 7th row: The same as the 5th. 8th row: Slip 1, purl 1, * knit 3, make 1, purl 4, and so on. 9th row: The same as the 5th row. 10th row: Slip 1, purl 1, * slip 1, knit 1, pass the slipped stitch over the knitted one, knit 2, purl 4, repeat from *. 11th row: Knit all the purled stitches, purl all the rest. 12th row: Slip 1, purl 1, * slip 1, knit 1, pass the slipped stitch over, knit 1, purl 4, and repeat from *. 13th row: The same as the 11th. 14th row: Slip 1, purl 1, * slip 1, knit 1, pass the slipped stitch over, purl 4, and repeat. 15th row: Slip 1, * knit 2 together, knit 3. Repeat from * 3 times more; knit 2 together, knit 2. The second row of patterns begins with the 16th row. There are only 4 in this 2nd row, so that after the 1st slipped stitch you purl 3 stitches instead of 1, and in the 2nd row, after the 4th made stitch, you purl 4 more stitches. Repeat alternately these 2 rows of raised patterns, and when you have a sufficient number of strips sew them together. Trim the quilt all round with a knotted fringe. 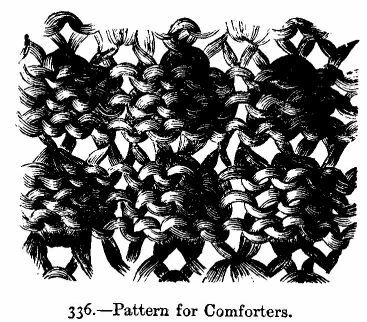 329.--Stitch in Knitting, for Couvrettes, Comforters, Opera Caps, Carriage Shawls, Jackets, &c.
Materials: Messrs. Walter Evans and Co.'s knitting cotton No. 20, or fine wool. 1st row: Slip 1, * make 1, knit 1, make 1, knit 1. Repeat from *. 2nd row: Slip 1, * knit 2 together, and repeat from * to the end of the row. 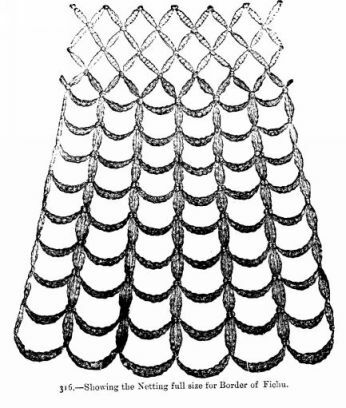 Illustration 330 represents a knitted veil in reduced size. 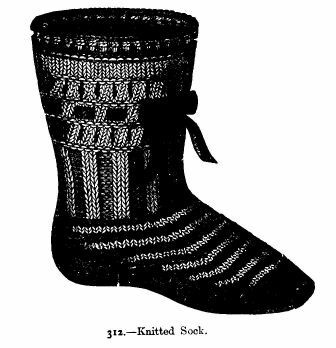 The original was worked with fine Shetland wool in an open pattern; it is edged with a knitted lace. Its length is 24 inches, its width 18 inches. Work the veil from a paper pattern of a shape corresponding to that of  illustration 330. Compare the paper shape often with the knitting in the course of the work, and try to keep them alike. the 1st row: * Knit 2, throw the wool forward, knit 2 together twice, repeat from *. 3rd row: Knit 1, throw the wool forward, knit 2 together, * throw the wool forward, knit 2 together twice, and repeat from *. 5th row: Like the 2nd row. The pattern must be reversed. The pattern figures increase with the increasings at the beginning and at the end of each row. 1st row: Slip 1, then alternately throw the wool forward, and knit 2 together. 2nd row: Entirely knitted; make 1 stitch of the wool thrown forward in the last row. When the veil is finished, wet it, and stretch it over paper or pasteboard; let it dry, and then edge it with the following lace:--Cast on 10, knit the 1st. 2nd row: Knit 1, throw the wool forward, knit 9. 4th row: Knit 1, throw the wool forward, knit 2, throw the wool forward, knit 2 together twice, knit 4. 6th row: Knit 1, throw the wool forward, knit 2, throw the wool forward, knit 2 together 3 times, knit 3. 7th row: Cast off 3 stitches, knit 10. 332.--Knitted Pattern with Raised Embroidery. Materials: Messrs. Walter Evans and Co.'s knitting cotton No. 8 or 20. This pattern is worked in rows going backwards and forwards with thick or fine cotton according to the use you wish to make of it. The star-like figures on the knitted squares are worked with soft cotton in point de poste. Cast on a number of stitches long enough (19 stitches are necessary for the two squares), work the 1st row: * Knit 11 stitches, alternately 4 times knit 2 together, throw the cotton forward. Repeat from *, The 2nd row is worked like the 1st, only purled, in this row, as well as in the following ones, the stitch must be knitted with the cotton thrown forward after the stitch, the last stitch of a plain square with the first cotton thrown forward of the open-work figure. The number of stitches in the last must always be 8. The pattern consists  alternately of these two rows. Each pattern contains 12 rows, with the 13th the squares are reversed. The star figures are embroidered with double cotton by working 5 chain stitch in the middle of each square; draw the needle underneath the knitting to the next centre of a square. Materials: Messrs. Walter Evans and Co.'s coarse knitting cotton; thick steel knitting-needles. This cover is suitable for either a large or a small table, as the pattern may be increased as much as required. It is suitable for antimacassars. Cast on 4 stitches, join them into a circle, and work the 1st round four times alternately. Throw the cotton forward, knit 1. 3rd round: * Throw the cotton forward, knit 1. Repeat 7 times more from *. After every pattern round knit 1 round plain. Until after the 21st round, we shall not mention this any more. 5th round: * Throw the cotton forward, knit 2 *. From the 7th to the 12th round the knitted stitches in every other round increase by 1 stitch, so that in the 12th round there are 7 stitches between those formed by throwing the cotton forward. 13th round: * Throw the cotton forward, knit 2 together, knit 4, knit 2 together *. 15th round: * Throw the cotton forward, knit 1, throw the cotton forward, knit 2 together, knit 2, knit 2 together *. 17th round: * Throw the cotton forward, knit 3, throw the cotton forward, knit 2 together, knit 2 together *. 19th round: * Throw the cotton forward, knit 5, throw the cotton forward, knit 2 together, *. 21st round: * Knit 1, throw the cotton forward, knit 5, throw the cotton forward, knit 2 *. 22nd round: * Knit 2, knit 2 together, knit 1, knit 2 together, knit 3 *. 23rd round: * Knit 2, throw the cotton forward, knit 3, throw the cotton forward, knit 3 *. 24th round: * Knit 3, knit 2 together, knit 5 *. 25th round: * Knit 3, throw the cotton forward, knit 2 together, throw the cotton forward, knit 4. 26th round: Entirely knitted *. 27th round: * Throw the cotton forward, knit 9, throw the cotton forward, knit 1 *. 29th round: * Knit 1, throw the cotton forward, knit 9, throw the cotton forward, knit 2 *. 31st round: * Knit 2, throw the cotton forward, knit 9, throw the cotton forward, knit 3 *. 33rd round: * Knit 3, throw the cotton forward, knit 9, throw the cotton forward, knit 4 *. 34th round: * Knit 4, knit 2 together, knit 5, knit 2 together, knit 5 *. 35th round: * Knit 4, throw the cotton forward, knit 7, throw the cotton forward, knit 5 *. 36th round: * Knit 5, knit 2 together, knit 3, knit 2 together, knit 6 *. 37th round: * Throw the cotton forward, knit 5 three times, throw the cotton forward, knit 1 *. 38th round: * Knit 7, knit 2 together, knit 1, knit 2 together, knit 8 *. 39th round: * Knit 1, throw the cotton forward, knit 6, throw the cotton forward, knit 3. throw the cotton forward, knit 6, throw the cotton forward, knit 2 *. 40th round: * Knit 9, knit 3 together, knit 10*. 41st round: * Knit 2, throw the cotton forward, knit 15, throw the cotton forward, knit 3 *. 42nd round: * Knit 3, knit 2 together, knit 11, knit 2 together, knit 4 *. 43rd round: * Knit 3, throw the cotton forward, knit 13, throw the cotton forward, knit 4 *. 44th round: * Knit 4, knit 2 together, knit 9, knit 2 together, knit 5 *. When the cover is completed, edge it all round, with the following border worked the short way:--Cast on 5 stitches and knit the 1st row, slip 1, throw the cotton forward, knit 2 together, throw the cotton forward, knit 2. 2nd row: Slip 1, knit the rest. Repeat this row after every pattern row. 3rd row: Slip 1, throw the cotton forward, knit 2 together, throw the cotton forward, knit 2 together, throw the cotton forward, knit 1. 5th row: Slip 1, throw the cotton forward, knit 2 together, throw the cotton forward, knit 2 together, throw the cotton forward, knit 2. 7th row: Slip 1, throw the cotton forward, knit 2 together, throw the cotton forward, knit 2 together, throw the cotton forward, knit 2 together, throw the cotton forward, knit 1. 9th row: Slip 1, throw the cotton forward, knit 2 together, throw the cotton forward, knit 2 together, throw the cotton forward, knit 2 together, throw the cotton forward, knit 2. 11th row: Slip 1, throw the cotton forward, knit 2 together, throw the cotton forward, knit 2 together, throw the cotton forward, knit 2 together, throw the cotton forward, knit 2 together, knit 1. 13th row: Slip 1, throw the cotton forward, knit 2 together, throw the cotton forward, knit 2 together, throw the cotton forward, knit 2 together, throw the cotton forward, knit 2 together, throw the cotton forward, knit 2. 15th round: Cast off 8 stitches, throw the cotton forward, knit 2 together, throw the cotton forward, knit 1. 16th round: Entirely knitted. Begin again at the 1st row, knit a sufficient length of the border, and then trim the cover with it on the outer edge. Materials: 4-thread fleecy wool; 2 wooden knitting-needles; 1 flat wooden mesh. Cast on a sufficient number of stitches, and knit the 1st row plain. 2nd Row--Slip the 1st stitch; insert the needle into the next stitch, and throw the cotton forward as if you were going to knit the stitch; place the mesh behind the needle in the right hand, and turn the wool which is on this needle upwards, bring it back again on the needle so that it is wound once round the mesh, and twice round the needle. Then only the double stitch through the second stitch, knit it, and insert the needle into the next stitch, and repeat what has been explained. Knit the last stitch without a loop. 3rd Row--Before drawing out the mesh, turn the work and knit one  plain row. Every double stitch is knitted as one stitch, so as to attain the same number of stitches as in the 1st row. 4th Row--Like the 2nd row. Repeat these rows as often as required. 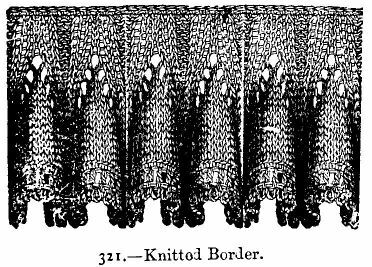 This knitting is chiefly used for borders of mats. Materials: 4-thread fleecy; 2 wooden knitting-needles. Cast on a sufficient number of stitches. 1st row: * 3 stitches in the first stitch, knit 1, purl 1, knit 1, knit 3 stitches together, repeat from *. 4th row: Knitted. Repeat these four rows, only in the next row the 3 stitches knitted together are worked on the 3 stitches worked in 1 stitch, and the 3 stitches to be worked in 1 stitch are to be placed on the one formed by knitting 3 stitches together. Materials: Messrs. Walter Evans and Co.'s crochet cotton No. 36; glazed embroidery cotton No. 10; steel knitting-needles. This pattern is knitted with very fine crochet cotton. The middle part as well as the lace border are worked separately; the latter is sewn on to the middle part. The spots in the thick parts are worked in afterwards with coarser cotton. Commence the pattern in the centre, cast on 6 stitches, join them into a circle, and knit 2 plain rounds. 3rd round: Alternately knit 1, throw the cotton forward. 4th and 5th rounds: Plain. 6th round: Alternately knit 1, throw the cotton forward. 7th round: Plain. Every other round is plain. We shall not mention these plain rounds any more. 8th round: Knit 2, * throw the cotton forward, knit 1, throw the cotton forward, knit 3; repeat from * to the end of the round; lastly, throw the cotton forward, knit 1, throw the cotton forward, knit 1. 10th round: * Throw the cotton forward, knit 1, throw the cotton forward, knit 2 together. 12th round: * Throw the cotton forward, knit 3, throw the cotton forward, knit 2 together, throw the cotton forward, knit 1, throw the cotton forward, knit 2 together. 14th round: * Throw the cotton forward, knit 5, throw the cotton forward, knit 2 together, throw the cotton forward, knit 1, throw the cotton forward, knit 2 together. 16th round: * Throw the cotton forward, knit 7, throw the cotton forward, knit 2 together, throw the cotton forward, knit 1, throw the cotton forward, knit 2 together. The 18th, 20th, 22nd, and 24th rounds are worked like the 16th round; only the middle plain part of the pattern figures increases by 2 stitches in every pattern round, so that there are 15 plain stitches in the 24th round between the 2 stitches formed on either side of the same by throwing the cotton forward. 26th round: * Throw the cotton forward, knit 6, knit 2 together, throw the cotton forward, knit 1, throw the cotton forward, knit 2 together, knit 6, throw the cotton forward, knit 2 together, knit 1, knit 2 together. 28th round: * Throw the cotton forward, knit 6, knit 2 together, throw the cotton forward, knit 3, throw the cotton forward, knit 2 together, knit 6, throw the cotton forward, knit 2 together, knit 1. 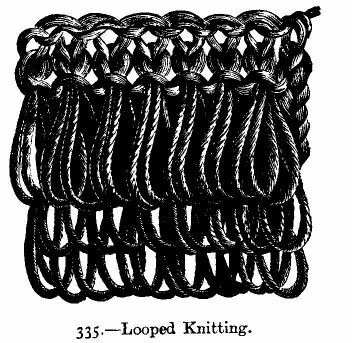 30th round: * Knit 1, throw the cotton forward, knit 2 together, knit 6, throw the cotton forward knit 3 together, throw the cotton forward, knit 6, knit 2 together, throw the cotton forward, knit 1, throw the cotton forward, knit 2 together, throw the cotton forward. 32nd round: * Knit 2 together, throw the cotton forward, knit 2 together, knit 13, knit 2 together, throw the cotton forward, knit 2 together, throw the cotton forward, knit 3, throw the cotton forward. 34th round: * Knit 2 together, throw the cotton forward, knit 2 together, knit 11, knit 2 together, throw the cotton forward, knit 2 together, throw the cotton forward, knit 5, throw the cotton forward. 36th round: * Knit 2 together, throw the cotton forward, knit 2 together, knit 9, knit 2 together, throw the cotton forward, knit 2 together, throw the cotton forward, knit 1, throw the cotton forward, knit 2 together, knit 1, knit 2 together, throw the cotton forward, knit 1, throw the cotton forward. 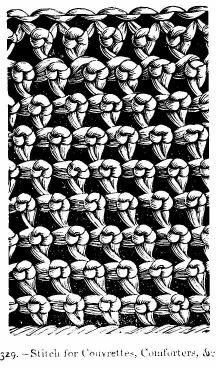 38th round: * Knit 2 together, throw the cotton forward, knit 2 together, knit 7, knit 2 together, throw the cotton forward, knit 2 together, throw the cotton forward, knit 3, throw the cotton forward, knit 3 together, throw the cotton forward, knit 3, throw the cotton forward. 40th round: * Knit 2 together, throw the cotton forward, knit 2 together, knit 5, knit 2 together, throw the cotton forward, knit 2  together, throw the cotton forward, knit 1, throw the cotton forward, knit 2, knit 2 together, throw the cotton forward, knit 1, throw the cotton forward, knit 2 together, knit 2, throw the cotton forward, knit 1, throw the cotton forward. 42nd round: * Knit 2 together, throw the cotton forward, knit 2 together, knit 3, knit 2 together, throw the cotton forward, knit 2 together, throw the cotton forward, knit 3, throw the cotton forward, knit 3 together, throw the cotton forward, knit 3, throw the cotton forward, knit 3 together, throw the cotton forward, knit 3, throw the cotton forward. 44th round: * Knit 2 together, throw the cotton forward, knit 2 together, knit 1, knit 2 together, throw the cotton forward, knit 2 together, throw the cotton forward, knit 3, knit 2 together, throw the cotton forward, knit 1, throw the cotton forward, knit 2 together, knit 3, throw the cotton forward, knit 1, throw the cotton forward, knit 5, throw the cotton forward. 45th and 46th rounds: Plain, then cast off loosely. 1st row: Slip 1, knit 1, throw the cotton forward, knit 2 together, throw the cotton forward, knit 2 together, throw the cotton forward, knit 2 together, knit 4, knit 2 together, throw the cotton forward, knit 2, knit 2 together, throw the cotton forward, knit 1, throw the cotton forward, knit 2 together. 2nd row: Slip 1, throw the cotton forward, knit 3, throw the cotton forward, knit 2 together, knit 2, throw the cotton forward, knit 2 together, knit 11. 3rd row: Slip 1, knit 9, knit 2 together, throw the cotton forward, knit 2, knit 2 together, throw the cotton forward, knit 5, throw the cotton forward, knit 1. 4th row: Slip 1, throw the cotton forward, knit 7, throw the cotton forward, knit 2 together, knit 2, throw the cotton forward, knit 2 together, knit 9. 5th row: Slip 1, knit 1, throw the cotton forward, knit 2 together, throw the cotton forward, knit 2 together, throw the cotton forward, knit 2 together, knit 2 together, throw the cotton forward, knit 2, knit 2 together, throw the cotton forward, knit 9, throw the cotton forward, knit 1. 6th row: Knit 2 together (knit together the stitch and the next stitch formed by throwing the cotton forward), throw the cotton forward, knit 2 together, knit 5, knit 2 together, throw the cotton forward, knit 2, knit 2 together, throw the cotton forward, knit 10. 7th row: Slip 1, knit 10, throw the cotton forward, knit 2 together, knit 2, throw the cotton forward, knit 2 together, knit 3, knit 2 together, throw the cotton forward, knit 2 together (stitch formed by throwing the cotton forward and the next stitch). 8th row: Knit 2 together, throw the cotton forward, knit 2 together, knit 1, knit 2 together, throw the cotton forward, knit 2, knit 2 together, throw the cotton forward, knit 12. 9th row: Slip 1, knit 1, throw the cotton forward, knit 2 together, throw the cotton forward, knit 2 together, throw the cotton forward, knit 2 together, knit 5, throw the cotton forward, knit 2 together, knit 2, throw the cotton forward, knit 3 together, throw the cotton forward, knit 2 together. 10th row: Knit 2 together, throw the cotton forward, knit 1, throw the cotton forward, knit 2, knit 2 together, throw the cotton forward, knit 14. 11th row: Slip 1, knit 11, knit 2 together, throw the cotton forward, knit 2, knit 2 together, throw the cotton forward, knit 1, throw the cotton forward, knit 3 together. Then begin again on the 2nd row, and work on till the border is long enough; sew the lace on to the centre, slightly gathering the former. Lastly, work in the spots with glazed or coarse embroidery cotton. Material: Messrs. Walter Evans and Co.'s knitting cotton No. 8 or 12. These braces are knitted with coarse white cotton, taken double; the braces themselves are worked in brioche stitch, the lappets are knitted plain. Begin at the bottom of the front lappet, make a foundation chain of 14 stitches, knit 5 rows plain backwards and forwards, then divide the stitches into two halves to form the button-hole; knit 15 rows on each of the halves consisting of 7 stitches; then take the 14 stitches again on one needle and work 17 rows on them. Then work a second button-hole like the first one; knit 6 more rows plain, increasing 1 at the end of every row, so that the number of stitches at the end of the lappet is 20. Then begin the pattern in brioche stitch; it is worked as follows:--Knit first 1 row, then slip the first stitch of the first following pattern row, * throw the cotton forward, slip the next stitch (slip the stitches always as if you were going to purl them), knit 2 together; repeat 5 times more from *; the last stitch is knitted. 2nd row of the pattern: Slip the 1st stitch, * knit 2; the stitch which has been formed in the preceding row by throwing the cotton forward is slipped after the 2nd knitted stitch; repeat 5 times more from *; knit the last stitch. 3rd row: Slip the 1st stitch, * decrease 1 (here, and in all the following rows, knit the next stitch together with the stitch before it, which has been formed in the preceding row by throwing the cotton forward), throw the cotton forward, slip 1; repeat from *; knit the last stitch. 4th row: Slip the 1st stitch, * knit 1, slip the stitch which has been formed in the preceding row by throwing the cotton forward, knit 1, knit the last stitch. Repeat these 4 rows till the braces are long enough. The pattern is 19 inches long. Then knit 6 rows plain, decreasing 1 at the end of every row, then work each lappet separately, dividing the stitches so that each lappet is 7 stitches wide. Each lappet has 72 rows; after the first 18 rows make a button-hole as described for the preceding one. Work 18 rows between the 1st and 2nd button-hole. The lappets are rounded off by decreasing after the 2nd button-hole. 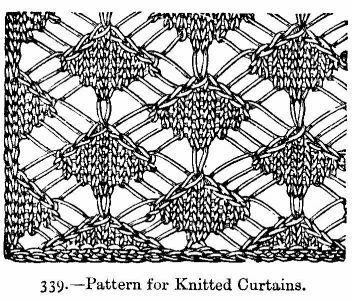 339.--Pattern for Knitted Curtains, &c.
Material: Messrs. Walter Evans and Co.'s knitting cotton No. 8. This pattern is suitable for knitting different articles, according to the thickness of the cotton used. The number of stitches must be divided by ten. The pattern is knitted backwards and forwards. 2nd row: * Knit 1, make 2, slip 1, knit 1, pass the slipped stitch over the knitted one, knit 5, knit 2 together, make 2. Repeat from *. 4th row: Knit 3, * make 2, slip 1, knit 1, and pass the slipped stitch over, knit 1, knit 2 together, make 2, knit 5. Repeat from *. 5th row: Purl 3, * make 2, purl 3 together, make 2, purl 7. Repeat from*. 6th row: Knit 3, * knit 2 together (1 stitch and 1 long stitch), make 2, knit 1, make 2, slip 1, knit 1, pass the slipped stitch over (the knitted stitch is a long stitch), knit 5. Repeat from *. Continue the pattern by repeating always from the 2nd to the 5th row; the 6th row is the repetition of the 2nd row, but it is begun (compare  the two rows) about the middle of the 2nd row, so as to change the places of the thick diamonds in the following pattern. This will be easily understood in the course of the work. Material: Messrs. Walter Evans and Co.'s knitting cotton No. 20 or 30. 1st row: Slip 1, knit 2 together, throw cotton forward, knit 2, knit 2 together, throw cotton forward, knit 2, knit 2 together, throw cotton forward, knit 3. This row is repeated 18 times more; the stitch formed by throwing the cotton forward is knitted as 1 stitch. 20th row: Slip 1, knit 2 together, make 1, knit 1; place next 3 stitches upon another needle behind the cotton, and leave them alone; knit 1, knit 2 together, throw cotton forward, now knit the first 2 of the 3 stitches which have been left; knit the last of the 3 together with the next stitch on the needle, throw cotton forward, knit 3. Repeat these 20 rows till strip is long enough. 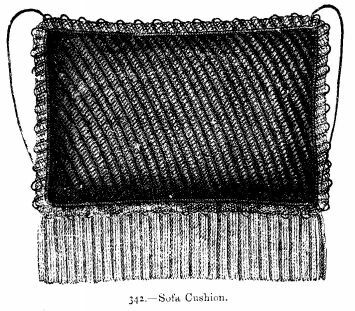 341 and 342.--Knitted Cover for Sofa Cushion. Materials: Messrs. Walter Evans and Co.'s knitting cotton No. 12; eight ply fleecy wool. These four rows are repeated till the cover is sufficiently large. Draw a narrow piece of red worsted braid through every other open-work row of the pattern, as can be seen in illustration 341. 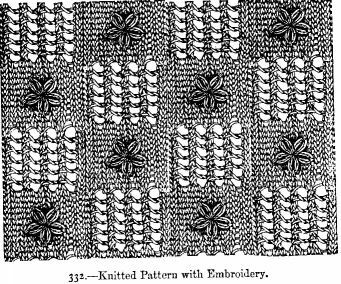 When the cushion has been covered with the knitting, it is edged all round with a border knitted the long way, in the above-mentioned open-work pattern; it is 14 rows wide, and also trimmed with worsted braid; a fringe of grey cotton and red wool, 3 1/4 inches wide, is sewn on underneath the border at the bottom of the cushion; to this is added a thick red worsted cord, by which the cushion is hung on over the back of an arm-chair. The  cushion, on account of its simplicity, is especially suitable for garden chairs. Material: Messrs. Walter Evans and Co.'s crochet cotton No. 12. 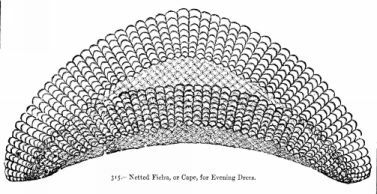 This cap is netted with crochet cotton over a mesh measuring three-quarters of an inch round; work first a long square for the centre  of the crown, cast on 28 stitches, and work backwards and forwards 27 rows with the same number of stitches. Then work 34 rounds round this square, and fasten the cotton. Then count 43 stitches for the front border, and 24 stitches for the back border, and leave them for the edge of the cap. On the remaining stitches on each side work the strings in 95 rows backwards and forwards on the same number of stitches; each string is pointed off at the lower end by decreasing 1 stitch in every row. Sew in a narrow piece of tape in the back border of the cap; the remaining part of the border, as well as the strings, are trimmed with crochet lace or with netted edging, No. 311. Material: Messrs. Walter Evans and Co.'s knitting cotton, 3-thread, No. 30. This nightcap is very simple and practical. It consists of two similar three-cornered pieces, sewn together so as to form a double triangle; the point of the triangle is turned back, as seen in illustration, and fastened on the lower half of the same. The cap is edged with a lace; a  similar lace covers the seam between both parts of the cap. 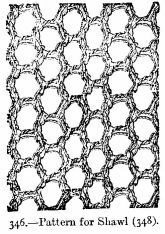 The pattern is worked with crochet cotton over a mesh measuring three-quarters of an inch round. Begin each half in the corner; cast on 2 stitches, and work backwards and forwards, increasing 1 stitch at the end of every row, till the number of stitches is 60. Then sew both halves together, and trim the cap and strings (the latter are worked as on the cap No. 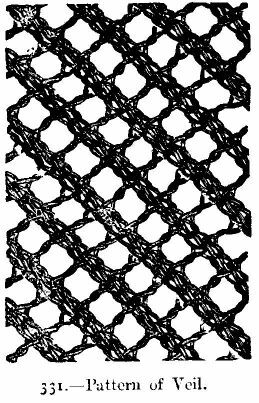 343) with the following lace: work 2 rows of open-work treble stitches--the treble stitches are divided by 1 chain--then work 1 row of double, always working 4 double round the chain stitches which divide 2 treble in the preceding row, or with netted edging No. 311. Materials: Messrs. Walter Evans and Co.'s knitting cotton No. 20 for couvrettes, or Berlin wool for sofa quilts. This pattern can be worked either in wool or cotton, and is suitable for many purposes. Cast on a sufficient number of stitches, divided by 18, for the 1st row: Knit 4, throw the cotton forward, knit 2 together, throw the cotton forward knit 2 together, knit 4, purl 6, repeat from *. 2nd row: The stitches knitted in the 1st row are purled as well as the stitches formed by throwing the cotton forward; the purled stitches are knitted. This row is repeated alternately, therefore we shall not mention it again. 3rd row: * Knit 6, throw the cotton forward, knit 2 together, throw the cotton forward, knit 2 together, knit 6, purl 2. 5th row: Purl 4, * knit 4, throw the cotton forward, knit 2 together, throw the cotton forward, knit 2 together, knit 4, purl 6. 7th row: Knit 2, * purl 2, knit 6, throw the cotton forward, knit 2 together, throw the cotton forward, knit 2 together, knit 6. 9th row: Knit 2, * purl 6, knit 4, throw the cotton forward, knit 2  together, throw the cotton forward, knit 2 together, knit 4. 11th row: * Knit 6, purl 2, knit 6, throw the cotton forward, knit 2 together, throw the cotton forward, knit 2 together. 13th row: Throw the cotton forward, knit 2 together, * knit 4, purl 6, knit 4, throw the cotton forward, knit 2 together, throw the cotton forward, knit 2 together. 15th row: * Throw the cotton forward, knit 2 together, throw the cotton forward, knit 2 together, knit 6, purl 2, knit 6. The knitting can now be easily continued from illustration. Materials Shetland wool, white and scarlet; steel needles. This shawl is knitted in the patterns given on Nos. 346 and 347. 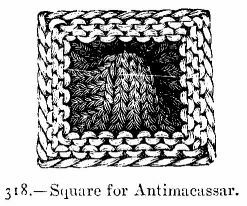 Both illustrations show the patterns worked in coarse wool, so as to be clearer. Begin the shawl, which is square, on one side, cast on a sufficient number of stitches (on our pattern 290); the needles must not be too fine, as the work should be loose and elastic. 1st row: Slip the first stitch, * knit 2 together, inserting the needle into the back part of the stitch, slip 1, knit 2 together, throw the wool twice forward; repeat from *. 2nd row: Knit 1 and purl 1 in the stitch formed by throwing the wool forward in the preceding row; the other stitches are purled. In the next row the holes are alternated--that is, after the 1st slipped stitch knit 1, throw the wool forward, and then knit twice 2 together. When 3 such open-work rows are completed, knit 1 row plain, and then  work the pattern seen on No. 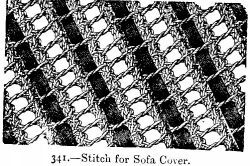 347, which forms the ground, and is worked in the following way:--1st row: Slip the 1st stitch, alternately throw the wool forward, and decrease by slipping 1 stitch, knitting the next, and drawing the slip stitch over the knitted one. 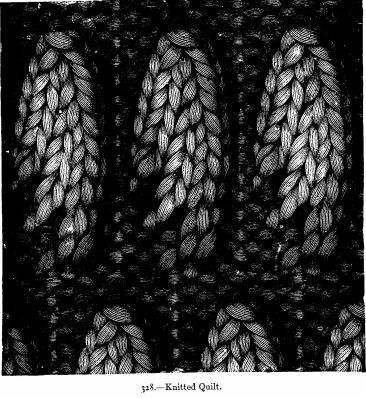 When 6 such rows have been worked in this pattern, work again 9 rows of the open-work pattern, but work on each side of the 2 stripes, each 6 stitches wide, in the pattern of the ground (No. 347); each first stripe is at a distance of 4 stitches from the edge, and each second stripe at a distance of 20 stitches. After the 9th open-work row, work again 6 rows in the pattern of the ground, then again 8 open-work rows, and then begin the ground, only continue to work on both sides of the shawl the narrow stripes of the ground pattern, the narrow outer and the two wide inner stripes of the border in the open-work pattern. When the ground (pattern No. 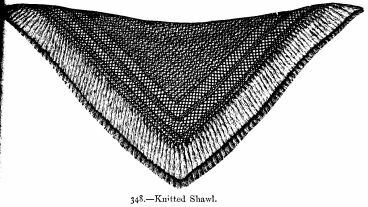 347) is square, finish the shawl at the top with two wide  and one narrow open-work row, as at the bottom, divided by stripes in the ground pattern. Knot in, all round the shawl, a fringe of scarlet wool; the fringe must be 3-1/2 inches deep. TABLE OF SIZES OF MESSRS. WALTER EVANS & Co.'s KNITTING COTTON, 3 THREADS.